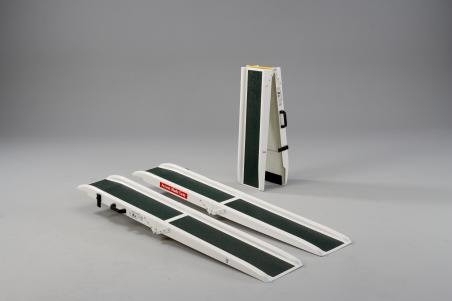 These portable folding channel ramps have a hinge in the middle, allowing them to be folded in half allowing easy transportation and storage. As well as being portable, and easy to set up and locate, these versatile ramps have a wealth of user friendly safety features. Their non-slip surface and raised edges make it very difficult for the wheelchair (or scooter) to go anywhere other than where its user decides. And the rounded corners will reassure those with safety concerns while preventing damage to vehicle interiors. Lightweight and available in two sizes – 6ft and 8ft.